This isn't the first time we've seen Sprint make use of one of Apple's ingenious products in their commercials and advertisements to promote their Overdrive 3G/4G Mobile Hotspot modem. It's not to say that they're strictly eying help from Apple to show off the connectivity power of their network, but we've seen them also use some of the portable gaming consoles in their commercials. Now the latest thing that Sprint is looking to capitalize off of is the undeniably successful launch of the Apple iPad – which could also potentially be gold for Sprint as they continue to talk highly about their next generation data network. 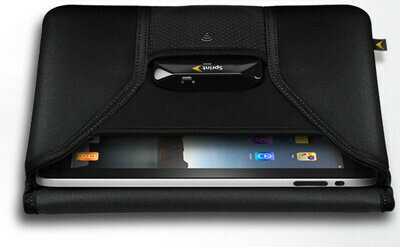 Although the 3G enabled version of the iPad is coming soon, Sprint is doing what they can now with the Wi-Fi only models as they are enticing owners with a free iPad carrying case for those who purchase their Overdrive 3G/4G Mobile Hotspot modem at Best Buy stores across the country. There's no arguing that iPad owners would take their prized gadget on the road, but sometimes they just come across certain areas where Wi-Fi signals are non-existent. That's where the Overdrive modem comes in to save the day to offer those customers some lighting speeds on their devices. The marketing around it is pretty slick we have to admit so far, but we'll see if it does indeed pay off in the end. Love it way to go Sprint.. major Sprint fanboy talking here!!! Sprint is playin it smart....real f*ckin smart lol. Cheers! thats a good idea....why pay for AT&T 3G service tht has been inconsistent for years when you can get sprint's 3g/4g network. True! but with the mobile hot spot, it's not just tethering... you also have the option to share. Plus the added 4G is pretty cool too. Phullofphil - the way vz works... it will ALWAYS total $60 in data.... phone data pac+PAM teather = (must equal) $60.... so it's the same price as the sprint 3/4G cards. It's free so I'm pretty sure they don't care. This is like a precussor to the Evo add, they'll have it doing all the stuff the iphone does but faster. They iphone slides in on the 8 spots the Evo has.